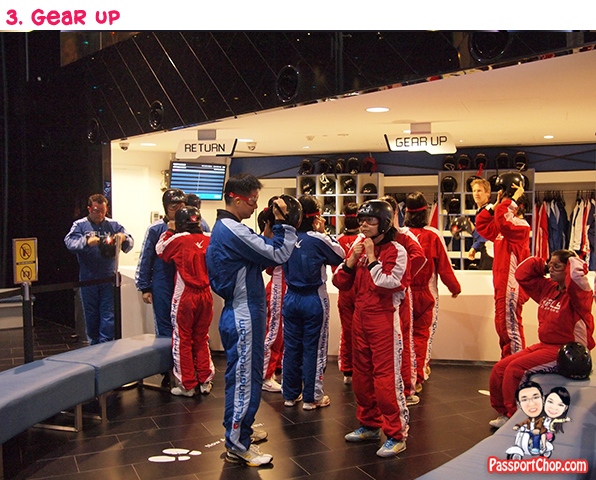 Unique Body Flight Experience with iFly Singapore @ Sentosa! Ever wanted to experience the thrill of skydiving but without having to overcome the fear of stepping out of a plane and worrying about whether the parachute will work? Or just wanted to feel what’s it like to fly? 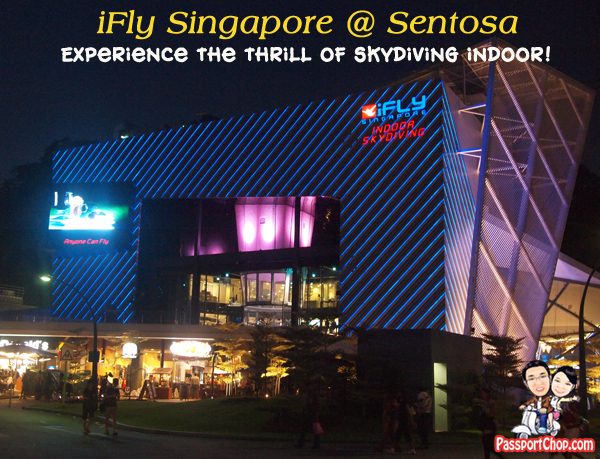 With iFly Singapore, you can experience all of the above in a safe environment at an affordable price and better still, you can do it right here in Sentosa, Singapore! iFly Singapore is the world’s largest indoor skydiving simulator and is the only wind tunnel that offers flyers (that’s you!) an unparalleled view of the South China Sea and a nightly firework display from the nearby Songs of the Sea. The entire body flight facility is themed like an airport terminal and offers a consumer flight journey unlike any other wind tunnel. In this post, we will be providing a sneak preview of the entire flight experience right from the beginning and sharing some tips on how to make your flying experience more enjoyable. [Offer Closed]: Only from 29 – 31 October 2011, you can enjoy savings of over S$150 and free photo & video souvenirs of your flight experience when you come in a group of 3 under the PassportChop-iFly Spooky Trip Blogger Special. The entire flight experience begins from the moment you buy your tickets – you will be expected to check-in at the ticketing counter 2 hours before your designated flight time. This will cater for enough time for training and gearing-up for the flight. – At least 7 years old etc. You will be required to sign an indemnity form – do give iFly Singapore a call if unsure of your eligibility to fly. The Training session provides a quick overview of key safety procedures and hand signals that flyers should take note of when flying in the tunnel. The information is provided in an easy-to-understand video followed by some hands-on practice by the flight instructor. Do pay attention especially the hand signals which will be the only form of communication you have with your instructor. Make sure you are wearing the right footwear for the flight – covered shoes with shoe laces; essentially it should not fly off during your flight so no slip-ons, slippers etc. You can rent shoes from iFly Singapore if you don’t have the right footwear. All loose items and accessories need to be taken off prior to the flight and you can use lockers to store them. After training, the group of flyers will proceed to the Gearing-Up area where you will collect your flight jumpsuit, goggles, helmet and ear plugs – while uncomfortable (due to the tightness), these equipment are important for a safe flight so wear them as instructed. Next, we Fly! You will go in with a group of fellow flyers and take turns flying throughout the entire flight. If you had signed up for the Challenge package ($89), you will get 2 skydives – each lasting for about 40 – 60 seconds. This flight time might seem short but trust me, you won’t feel that way when you are inside (especially if you have never skydived before). Not only is the flight experience fun and accelerating, it actually provides you with a full body workout! Your abs, thighs, arms might feel quite sore the next day if your flight posture is not correct (remember the training where I mentioned hand signals are critical?) – your instructor will try to correct your posture while inflight to ensure you get the right lift and maintains stability. You might have seen the professional skydivers spinning around and sometimes doing that upside down and think it is easy to do but in reality it is not! Even to keep the belly down position stable is a huge challenge – the simple act of controlled veering to the left or right and spinning around will take lots of flight hours to master! Most importantly, you should relax and stay alert to instructions while flying – being too stiff will make it harder for the instructor to correct your posture. And Yes! Remember to smile for the camera as your entire flight is captured on video and some parts in photos. Your mouth will become quite dry after the flight as the strong wind will blow your saliva upwards and all over your face if you open your mouth during the flight! Despite the slight inconveniences, the flight experience is a very memorable and fun one! As Lawrence, the founder of iFly Singapore puts in, the flight chamber is like a “Smile Factory” – everyone comes out of it with a huge smile! If there are leftover time (usually due to smaller group of flyers), you can let the instructor know that you want extra skydives and these will be charged at a much lower rate (about S$30 per skydive) than if you were to buy a new package. So grab this opportunity to experience flying at a much affordable rate! 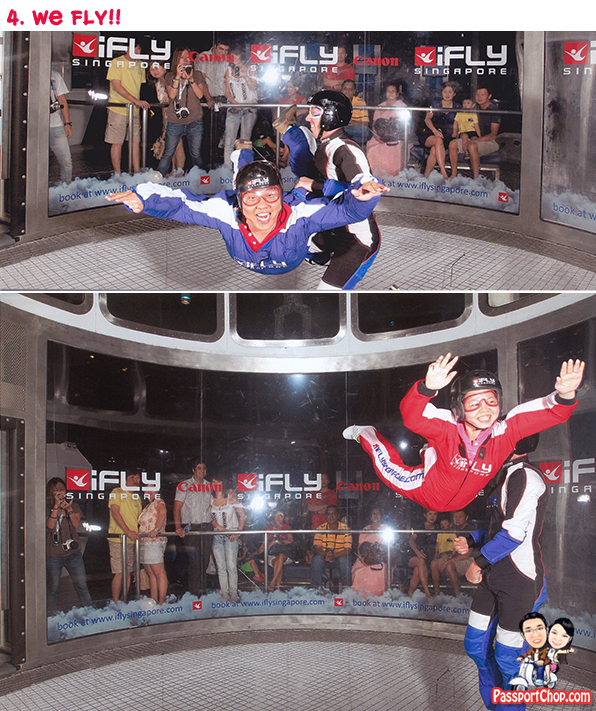 To see what’s it like to fly with iFly Singapore, check out the video below for embarrassing moments of ZQ struggling with the wind and how TY was able to fly around so gracefully, making a few spins around the chamber. The highlight of our iFly experience was the 3rd skydive where our instructor took each of us on a spin to the top of the wind tunnel! It was enjoyable as we really were flying and very little effort was needed on the flyers’ part as the instructor did all the work!! Tempted? Now there is another reason to give iFly Singapore a try – Cheaper Flights & Free Photos & DVD Video of your Flight Experience only with PassportChop-iFly Singapore’s Spooky Trio Special! To enjoy this promotion, come in a Group of Three to enjoy a 20% off their Adult First Timer Challenge Package from 29 to 31 October 2011. Besides this discount, you and your friends will also be able to receive TWO photos and ONE DVD of your flight experience for FREE! Savings of over S$150 for you and your friends!! 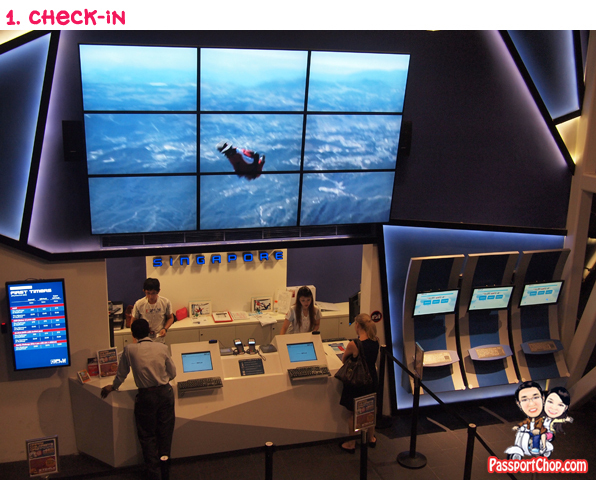 All you have to do is to flash this blog post on iFly Singapore (on your mobile phone, laptop or just print it out), bring it down to iFly Singapore and present it upon purchase of your flight tickets at iFly Singapore’s ticketing booths! As easy as that! Seems to be a good alternative. No real danger but likely to be at least also a bit exciting. I think, from the photos, that you enjoyed your little adventure. Nice activity. Isn’t it pricey? I like to try this…It sounds like great and adventure..Thanks a lot for sharing this post! I want to voice my appreciation for your kindness for males and women that really need help using the subject. Your personal dedication to passing the solution down and up became extremely significant and has constantly allowed associates much like me to attain their goals. Your individual helpful publication denotes a lot to me and a whole lot more in order to my office colleagues. Thank you; from each one of us. This website publish is great, probably because of how nicely the subject was developped. I love some of the remarks as well though I could prefer all of us stay on the actual suject so as increase the value of the subject! This design is incredible! You definitely understand how to keep a reader entertained. Involving the humor and your videos, I had been nearly moved to start my very own blog (well, almostHaHa!) Great job. I truly loved that which you had to state, and most that, the way you offered it. As well cool! Only visited Singapore for the first time recently, but next time I visit, and I’ll definitely be back when my travel plans allow, I will be sure to check out this amazing experience. Discovered your write-up very exciting indeed. I definitely appreciated reading through it and you make fairly some good details. I will bookmark this web-site with the upcoming! Relly fantastic post. I just want to mention I’m beginner to blogs and truly enjoyed your page. Very likely I’m likely to bookmark your blog . You absolutely come with fabulous posts. Bless you for revealing your blog. Such clever work and reporting! Keep up the great works guys I’ve you guys to blogroll.